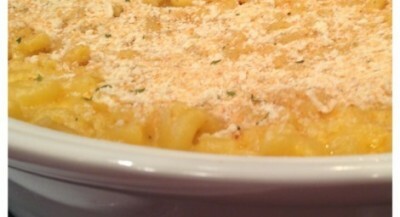 My kids are always asking me to make my famous macaroni and cheese when they come home to visit. I am also requested to bring this to cookouts or dinners. I always make a double batch and it’s funny because the host will say; “oh good I can save some for myself”.. I laugh and say; “there won’t be any left”. And there never is a single noodle left. When making this dish for a casual event use the disposal pans. No clean up!! Sometimes I even like to add in fresh basil and left over sauté zucchini and summer squash! Of course you can add in lobster and ham if you want to make this an entire meal. This is also this amazing cheese called Parrano – You can use this cheese to make a great macaroni and cheese. Try with just this cheese alone to enjoy the taste of Parrano! Boil water in a large pot and add a big scoop of salt. Cook the pasta based on the box directions minus 3 minutes, and drain. In another large pot, melt the butter (do not let the butter brown), using a whisk add in flour and mix until you form a couple of balls at the bottom of the pan. Add the milk and whisk more. Slice the cheese ends, and grate the cheddar cheese. Melt all together then add salt and pepper. Mix the pasta and cheese sauce together. Coat a 9 x 13-inch dish with cooking spray (even the sides). Put the mixture in the dish and sprinkle with a light coat of bread crumbs. Bake for 30 minutes; let sit for at least 5 minutes before serving. Cooks Note: Depending on the types of cheeses you are using there may be a need for additional milk and/or butter. The cheese mixture should be creamy. If too think then start by adding a few tablespoons of milk. Also, I like to add small dabs of butter on the breadcrumbs before baking! Try it and you will see why..